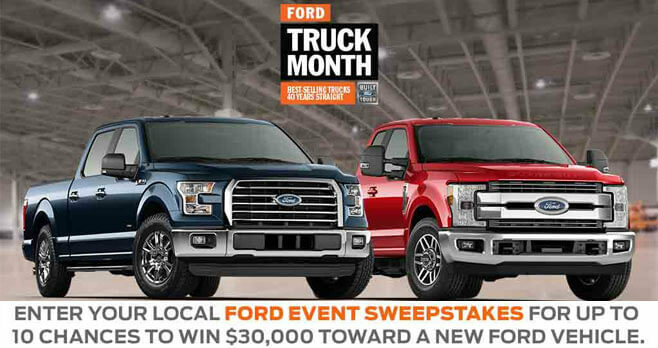 Ford Truck month is here! In March, you can take advantage of special Ford offers and incentives. Plus, enter the Ford Event Sweepstakes 2017 at FordEventSweepstakes.com and you could win $30,000 toward a new Ford vehicle. Last year, fans had the chance to win a 2016 Fusion, 2016 Focus, 2016 Escape, 2016 Explorer or 2016 F-150. In 2017, participants can earn up to 10 chances to win a 2017 Fusion, 2017 Focus, 2017 Escape, 2017 Explorer or 2017 F-150. To enter, visit FordEventSweepstakes.com now through January 3, 2018 then, watch a short video and register. If you want to increase your chances, watch all of the videos and receive five chances to win. Plus, share with your friends and earn up to five more chances to win. Eligibility: The Ford Event Sweepstakes 2017 is open to legal residents of the 50 United States and the District of Columbia, who are 18 years of age or older and have a valid driver’s license at the time of entry. Sweepstakes Period: Begins on February 15, 2017 at 5:00:00 pm EDT and ends January 3, 2018 at 5:00:00 pm EDT. Limit one Entry per Activity per person. Limit 5 Sharing Entries per person/email address during the Promotion Period. Limit one Bonus Entry per person. Random Drawing: Winner will be selected on or about 3/27/2017 in a random drawing from among all eligible entries received. Grand Prize (1): $30,000 voucher good for the purchase of one of the following 2017 Ford vehicles: Fusion, Focus, Escape, Explorer and F-150. Bonus Prize (1): $500 awarded in the form of a check made payable to the winner. Winner’s List: For the names of the winners or copy of Official Rules, send your request to Ford Event Sweepstakes Winners List 3070 Bristol St. Suite 580, Costa Mesa, CA 92626. Requests must be received by 2/2/18. Sponsor: Flashpoint Communications, LLC, 3070 Bristol St. Suite 580, Costa Mesa, CA 92626.